Clementine’s journey comes to a bumpy end. Remember the last episode of Lost? Where several seasons’ worth of narrative groundwork was abandoned in favour of a series of nostalgic flashbacks and weepy reunions? Looking back, you can see the sense in it: having written themselves into a corner, the show’s creators decided to tug at viewers’ heartstrings in the hope that they’d invested enough in the characters to at least feel emotionally satisfied. The Walking Dead: The Final Season doesn’t have the same knotty lore to deal with, but attempts to pull off a similar trick. Unlike Lost, it’s a missed opportunity to connect more fully with its past. But it’s similarly likely to provoke tears—and a few howls of frustration besides. Whether this is close to the send-off that was originally planned for Clementine is hard to divine—but surely her story wasn’t set to wrap up quite like this. It hardly needs repeating that the team that finished this season isn’t the same as the one that started it (they’re credited as the ‘still not bitten’ team, which feels like a crass misjudgement in the circumstances). Penultimate chapter Broken Toys doesn’t seem to bear too many obvious scars from Telltale’s sudden, awful closure, suggesting the bulk of the work had already been done. Instead, it’s the last, crucial chapter of Clem’s story that feels curtailed and compromised. Until then, the final season makes a case for being the strongest since the first. Our increasingly world-weary protagonist has grown from a timid child to a tough-nosed survivor, prepared to do whatever it takes to keep her friends and loved ones alive. Here, her story comes full circle: she’s now the adult half of a surrogate parent/child relationship, imparting vital life lessons to the orphaned AJ as Lee did to her in Season One. You have a little more input in the rules you establish for the kid, but otherwise we’re on similar narrative ground—with one small but significant difference. Born into a violent world, AJ has never known what life was like before the zombies arrived. As a result, he’s much more volatile, with a twisted sense of right and wrong. At times, that makes for great drama. You’re often reminded that he’s just a kid, though his outbursts make him a very different proposition from young Clementine. It’s a risky move: hardened by circumstance, he can be difficult to warm to, but trying to address his warped idea of morality leads to some thought-provoking moments as Clem is forced to consider the hypocrisy of her own behaviour. And you’ll soon learn that leading by example only goes so far. Your choices can be misinterpreted in ways you don’t expect—most obviously in a disturbing scene right at the end of episode one, a jaw-loosening cliffhanger that proves, after all this time, The Walking Dead is still capable of shocking us. To paraphrase Hideo Kojima: you will feel ashamed of your words and deeds. It also handily solves the second season’s biggest issue, where Clem somehow became the de facto leader of a bunch of adults. Now, having fallen in with a group of school-age survivors at an institute for troubled youngsters, it makes more sense that she’s the decision-maker: she has, after all, spent longer in the world beyond the boundaries these resourceful kids have established. And the story pumps the brakes just often enough for us to get to know them—though as ever with The Walking Dead, it’s best not to get too attached. A nearby group of survivors hoping to forcibly ‘recruit’ your new friends are this season’s main threat, while the confrontations that follow include a surprise encounter with a face from Clem’s past. As usual, the writers get to decide which relationships are important, though this time you’re given the option of beginning a tentative romance with the introverted Violet or laid-back Louis, offering some welcome moments of tenderness amid the tension. Regardless of your choice, Clem’s love interest is largely sidelined in the later stages—even more so if you make a certain, seemingly unrelated, decision in an earlier scene. But that’s nothing compared to an eleventh-hour surprise that feels like a total cheat. It hinges upon a sequence that requires at least two huge leaps of faith on the player’s part, undermining the credibility of the climax. Yet I’d be lying if I pretended, as with Lost, that I stayed dry-eyed until the credits—though much of that is down to the efforts of those who never got the opportunity to put the finishing touches to Clementine’s story. 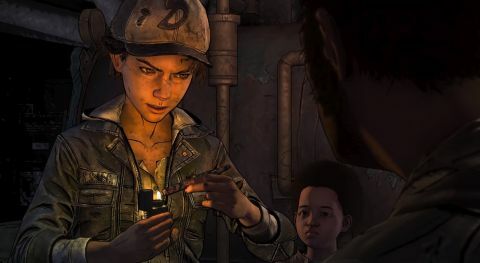 She may have been too good a character to be left in limbo, but this concluding chapter leaves you wondering what might have been had Telltale still been around to close the book.